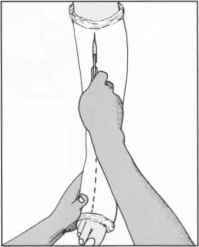 Where possible, the assistant should hold the limb in such a way (hat the surgeon has a clear run while applying the plaster (I). 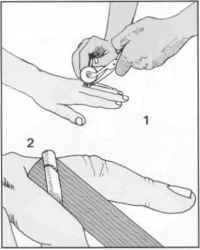 Where support must be given to a part included in the plaster, the fiats of the hands should be used, and the hands eased proximally and distally to avoid local indentation. Where slabs are used, try to let gravity assist rather than hinder (2). 37. Removal of rings (a): Wherever possible rings should be removed in ease linger swelling leads to distal gangrene. 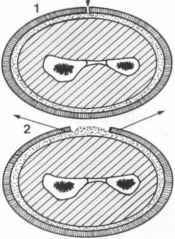 A tight ring can generally be coaxed from a linger if it is well coated with olive oil or a similar lubricant. If this fails, the linger may sometimes he sufficiently compressed by binding it with, for example, macrame twine to allow removal as shown. 38. 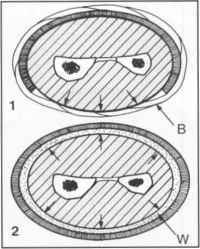 Removal of rings (b): Otherwise a ring may be cut with a ring cutter (I) or a saw cut may be made with a line tooth hacksaw on to a spatula (2) to spring the ring. Ring removal is nevertheless sometimes obsessively pursued. If significant sw elling is unlikely, the ring loose below the knuckle, the patient intelligent and the potential danger is indicated, it may be retained with acceptable safety. 40. 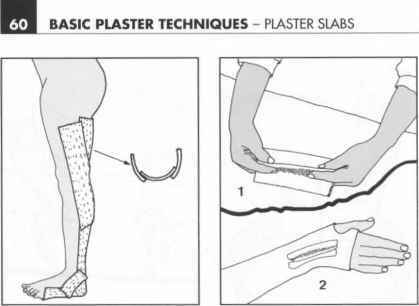 Plaster precautions (b): Consider splitting any complete plaster. This should be done routinely after any operative procedure when swelling may be considerable (from tourniquet release, postoperative oedema, etc.). Use a sharp knife and cut down through the plaster to the underlying wool (the wool protects the skin). This should be done immediately after application of the plaster before it has had lime to dry out. 41. 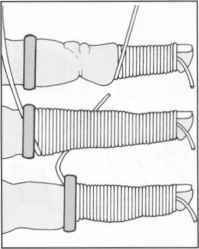 Plaster precautions (c): Be sure the plaster has been completely divided down to the wool along its whole length (I). I Any remaining strands will act dangerously as constricting bands.) You should be able to see the wool quite clearly. The plaster edges should spring apart by 5-10 mm or they may be eased apart by the handle of the knife, thereby dynamically relieving any underlying pressure (2). 42. 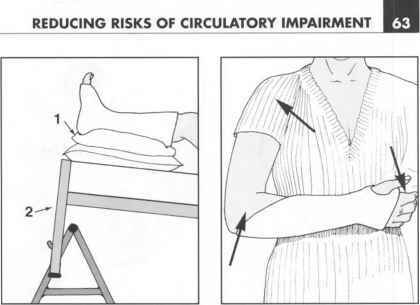 Elevation (a): Wherever possible, the injured limb should be elevated In the case of the hand and forearm in a patient who has been admitted, the limb may be secured in stockinet (or in a roller towel using safety pins) attached to a drip stand at the side of the bed. Elevation should be maintained at least until swelling is beginning to resolve. 43. 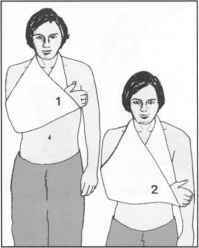 Elevation (b): In the case of the ambulant patient a sling may be used, provided the arm is kept high enough < I). 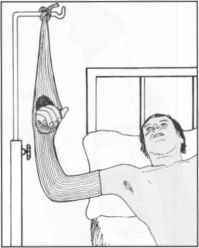 If the sling is too slack the arm will hang down, encouraging oedema (2). 44. Elevation (c): In the case of the lower limb, the leg may be elevated on pillows (I). The end of the bed may be raised on an A-frame or on chairs (2). The ambulant patient should be advised to keep the foot as high as possible on a couch or chair whenever they are at rest. 45. Exercise: Those parts free of plaster should be exercised as frequently as possible, e.g. the lingers in a Colles fracture (and later the elbow and shoulder). The patient should be shown how they should curl the lingers into full flexion and then fully extend them. They should lie given clear instructions as to how frequently to perform these exercises (e.g. for 5 minutes every' waking hour). How to use bandages to assist in a fracture? How to apply bandages in different fractures? Which bandage use in cracked leg bandage name?